We made a quick trip to Summerhills to check out their bouldering park. It is a manufactured bouldering park in much the same vain as Whickham Thorns in Dunston, Gateshead but with some very big differences. 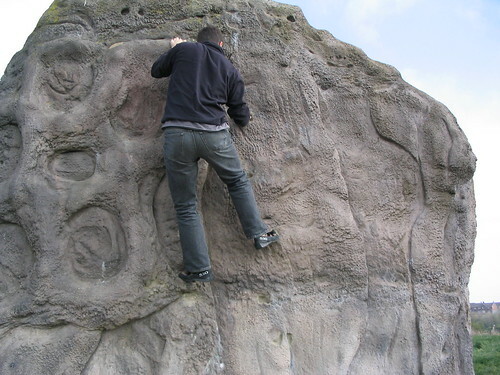 Firstly it is much larger – with the bouldering spread over about 6 (I think) boulders of varying sizes. Also there is a perceptual thing where the boulders are sunken down a bit and are slightly higher than the surrounding grass, giving you the feeling your not quite as high as you really are (which actually helps!). The first boulder is the biggest and has some fun problems on, Managed a couple on the west side (the one with all the 2 foot holes on) and another round the right of that (a easy roof pullover problem). There are plenty of good holds and the smearing feel firm. It was perhaps a little too hot for any good slopers as after a few seconds my hands would start to slip. So all in all a very enjoyable experience, and only 10 minutes from my parents house so I suspect I shall be back again. And what do you think? Is it any good?